A former Minister of Police Affairs, Major General David Jemibewon (retd. ), and a former Director of Military Intelligence, Brigadier-General Ajibola Togun (retd. ), have supported former President Olusegun Obasanjo’s decision to endorse the 2019 presidential bid of his former Vice President, Atiku Abubakar. 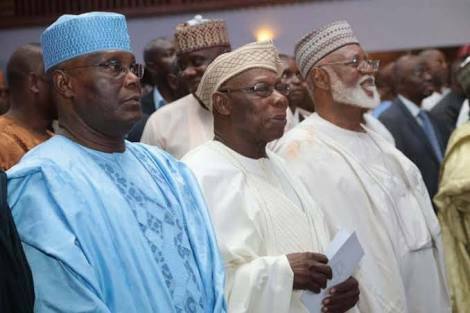 Obasanjo had on Thursday declared his support for Atiku, exactly four days after the ex-VP emerged as the presidential candidate of the Peoples Democratic Party. the former President was eminently qualified to assess the political situations in Nigeria. He said, “People may argue Obasanjo had consistently given bad report or opinions on Atiku but the salient question is: Is it not possible that you may hold an opinion today and tomorrow you hold another opinion? “I think he has the right to do that and he has not violated any law, written or unwritten for doing that. He is expressing his democratic right. And I do not think anybody can query that. “Chief Obasanjo had occupied that highest position in the country and so if anybody is really qualified to make an assessment of any situation politically in this country, he is the one. Asked about his thoughts on Atiku’s presidential candidacy, Jemibewon said, “Concerning the 2019 general elections, Nigerians should do what they believe is right constitutionally. “They should do what will bring progress to our country by voting for the person they believe will do the job and do it well by making Nigerians feel very proud and progressive once more. He added, “As far as the PDP is concerned, Atiku is the best. He is a qualified person and we pray he succeeds and that the country makes progress under his presidency. “Atiku has the qualities to move the economy, unite Nigerians and address insecurity, insurgency and other developmental challenges of the country. Speaking to The Punch, Togun, who is also a former deputy director of States Security Services (now Department of State Services), also commended Obasanjo for forgiving and endorsing Atiku. He said the former President did the right thing by letting go of the past and seeking a way to move the country forward. He said, “There’s nothing wrong with what Obasanjo did. He did it as a matter of candidacy and not really as a party issue. “They had differences, but from what the ex-President said, he said he saw that the former Vice President had retraced some of his steps.